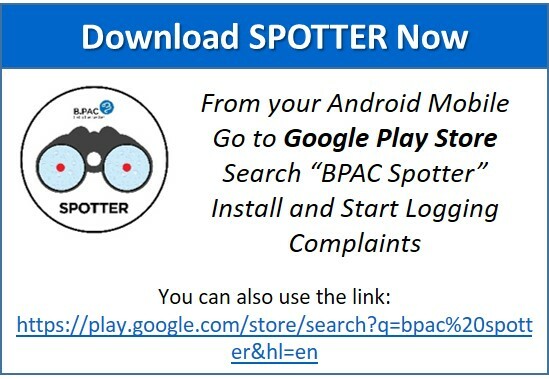 Spotter is a B.PAC initiative that can help citizens (in Bangalore) quickly and efficiently report issues and concerns in their neighbourhood. Citizens can file their observations, grievances and suggestions for action by various govt. and municipal departments like BBMP, BESCOM, BWSSB, POLICE (Crime & Traffic) etc. The Spotter solution comprises of two Smartphone Apps. The client App will facilitate the general public to quickly capture the picture and other details of the complaint and forwarding it to us. A back-end App will work towards reaching the complaints to respective officers (ward-wise) in govt. departments. Spotter is a crowd-sourcing initiative to gather crucial information about various aspects of safety, traffic, cleanliness, mobility etc. and prevail upon the Civic agencies to change. Complaint Category: Each complaint will necessarily have to be identified as to which category it belongs. The categories are based on areas like roads, hoardings, animal control, solid waste management, forest, lakes and many more. Each category will have a sub-category. Also the categories are mapped to specific departments within BBMP and other similar organizations. Proper category and sub-category selection by the user will ensure the complaint being directed to the right department and right person role within the department. Capture a picture: This option will allow the user to activate the camera in the mobile and take picture of the spot where the complaint is being reported. Capture GPS (lat/long) parameters: with every picture captured, it is very much essential that the GPS parameters are mandatorily captured in the system. This is very useful when the BBMP officer or the call center folks need to locate the position of the complaint in the specific area. Ward: A drop down list of wards will be shown to the user to select the appropriate ward. Comments: A text box for user to enter comments is provided. User can provide more details about the nature of complaint and the related nuisance caused. Track Your Complaints: This feature provides the facility to the user to track his/her complaints in terms of progress and closure. Pending Complaints: This feature has been provided to facilitate offline complaint capture and submit when the user is within the Wi-Fi internet range. After capturing the picture and other information if he/she does not have the internet access, the user can “Save” the complaint details using the “Save” button. The App will store all details saved by the user and make these available in a separate screen when the user clicks on the “Pending Complaints” button on the home screen. 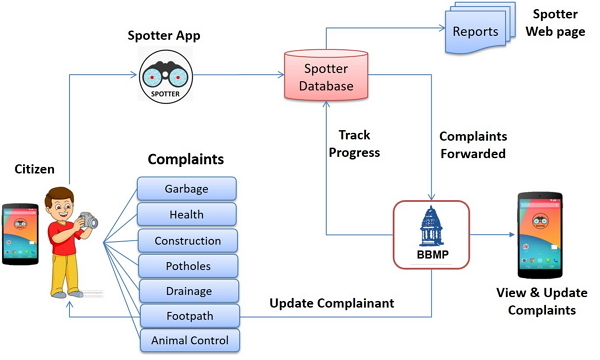 As on now Spotter is fully integrated with the BBMP complaints management system (Sahaaya). Soon we will be coming up with Spotter being integrated with BWSSB and others later.